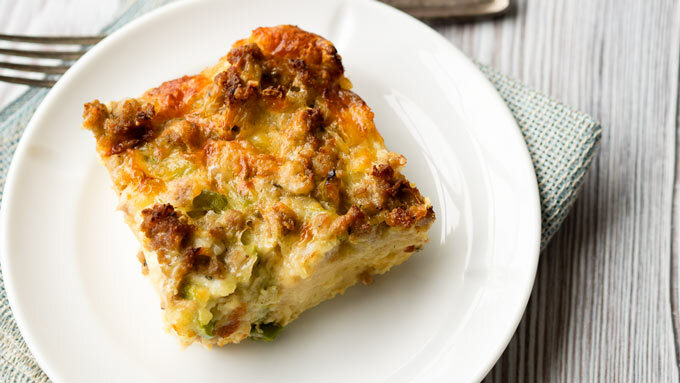 Breakfast casserole season is fast approaching! 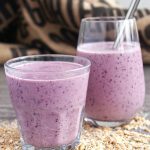 Are you looking for easy and quick breakfast recipes to feed a crowd? 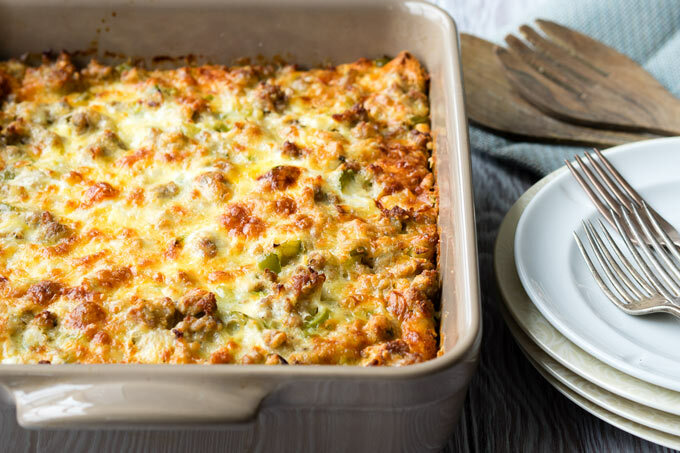 Here’s a hearty and filling Sausage and Egg Breakfast Casserole that the entire family will love. This casserole can feed 8-12 people, depending on how you cut it. 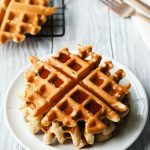 It’s a simple and comforting breakfast recipe that is perfect for the holidays, when friends and family might be visiting and staying as house guests. This casserole is so good that you’d be proud serving this breakfast on special days like Christmas morning or Thanksgiving morning too. 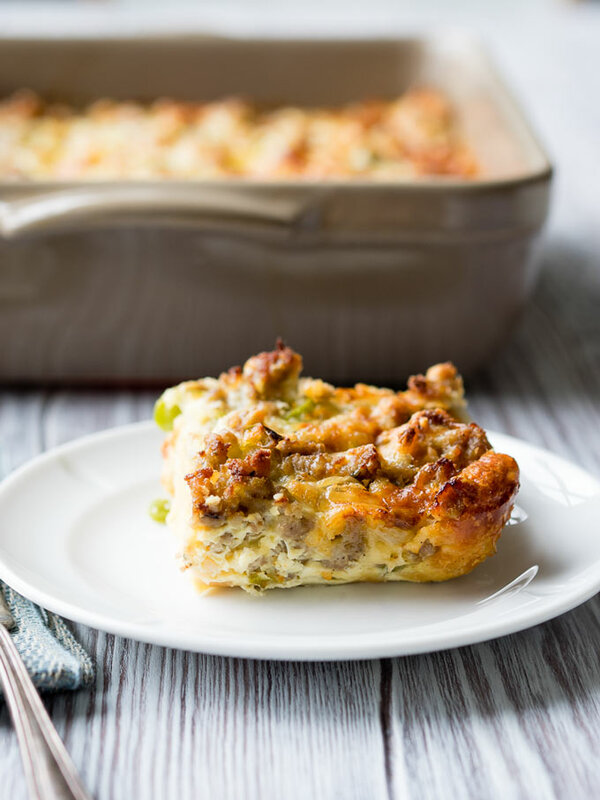 This Sausage and Egg Breakfast Casserole is so easy to make! 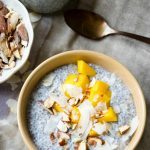 Because it’s a make ahead recipe, you can prepare this breakfast the night before and save your energy in the morning for waking up. In the large skillet, sauté the onions, peppers and sausage until everything is cooked through. In the large bowl, beat the eggs, milk and black pepper together. Grease the large casserole dish. First, layer on some big croutons like these. Next, layer on the cooked sausage mixture. Last, layer on the shredded cheese. Pour on the egg mixture. Cover and allow the Egg Sausage Breakfast Casserole to sit in the refrigerator overnight. The next morning, you’ll just need to pop the casserole dish in the oven. How easy was that? 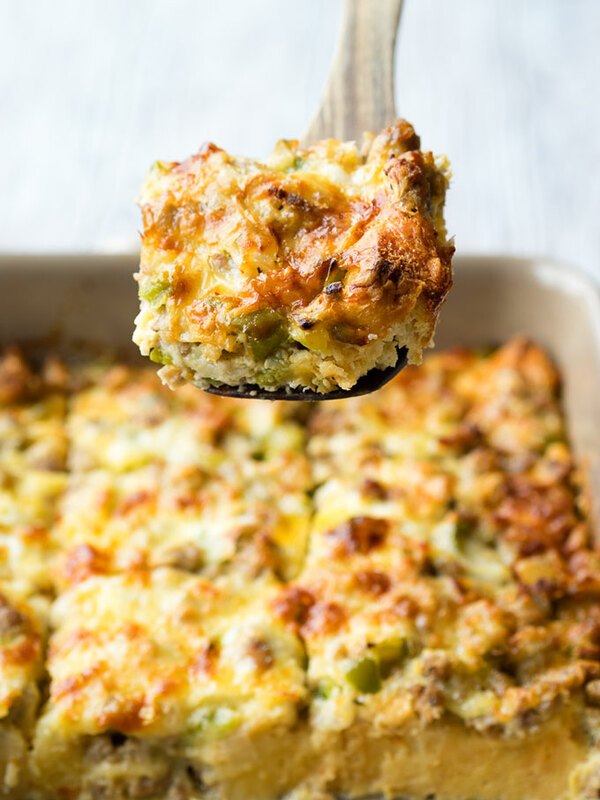 And just like that, your guest will be raving about the best Sausage Egg Breakfast Casserole. One tip on baking this breakfast casserole — don’t undercook it. When you think it’s done, pull it out of the oven and insert a knife in it. The knife should come out clean, and the casserole should be set in the middle. If the cheese is browning too quickly in your oven, you can cover it with a piece of foil for the last bit of baking. But crispy cheese is delicious on top too, so you’ll want some of it brown! 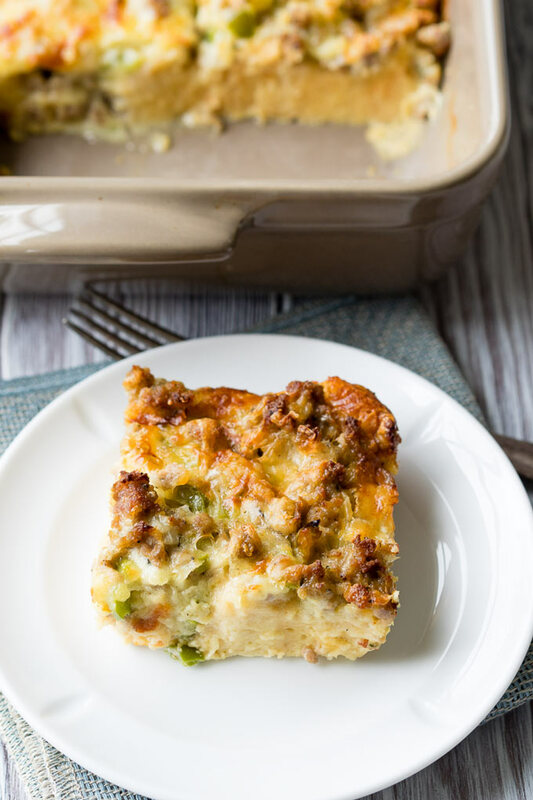 The secret ingredient this sausage egg cheese breakfast casserole is big croutons! 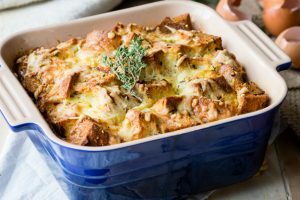 While many breakfast casseroles use bread, this recipe is made without bread. Why use croutons? 1) It saves time. How lazy am I that I don’t even want to cube bread?! I’m almost embarrassed. But then I think about having to slice and cube bread, wash up the cutting board and knife, and wipe down the worktop, I am not ashamed one bit that I use croutons in this casserole. Open a pack of croutons and dump them in the casserole dish. My toddler can do a lot of damage in the time it takes me to cut a slice of bread. 2) Croutons can live in the pantry. I can always have a bag of croutons handy to make this recipe. I don’t have to worry about bread going bad or stale. 2) Croutons give you the perfect texture. This is probably the most important reason. Croutons soak in the perfect amount of the egg custard. The one regret to these photos is that I didn’t get a clear picture of when I cut right through a crouton. You can get a glimpse of it in some of the photos, but sorry there is no close up to show you. Look in the photo below though. Look in the pan. I know this is not a great photo, but you can see that smooth edge of the casserole in the bottom right corner. That’s where I sliced right through a crouton. It becomes a custard pillow. When I say that every single bite is loaded with sausage, egg and cheese, I mean it. 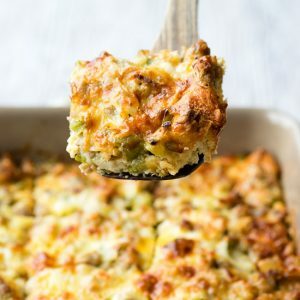 Every single bite of this breakfast casserole is packed with flavor. There’s an entire pound of sausage meat in this casserole. You also need eight large eggs. Top that all with a cup and a half of shredded cheese. One cup might have been more reasonable. Two cups was decadent. Don’t be shy if you want it decadent. 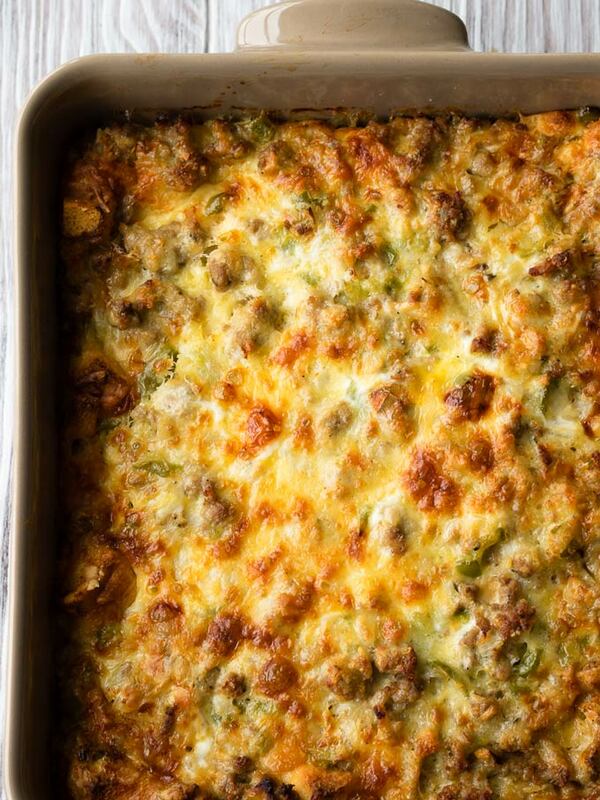 You make this breakfast casserole by first layering the croutons, sausage, and cheese. Then pour the egg mixture over it all, covering everything and letting it soak in the mixture overnight. That way, all the ingredients are evenly dispersed in this sausage egg cheese casserole. No matter how you cut it, all your guests will get a large serving of sausage, egg and cheese. 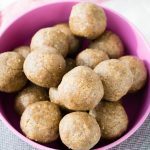 You can use store bought sausage in this recipe, but I love using my homemade breakfast sausage mix. If using my homemade breakfast sausage recipe, skip the step on shaping the sausage patties. Just add the sausage meat directly into the skillet after mixing, and sauté it. You’ll only need half the homemade sausage recipe, so you can cut the recipe in half. But better yet, make the other half of the recipe into sausage patties and freeze them for another breakfast. 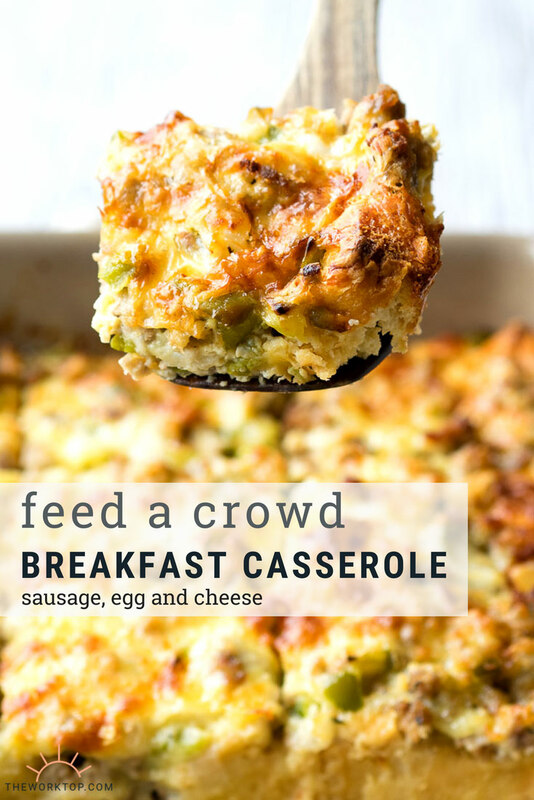 Looking for a breakfast recipe to feed a large group? 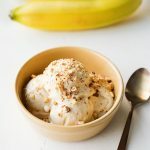 Do you need a breakfast to bring in for a work potluck? 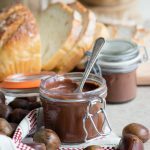 Would you like to host brunch parties? 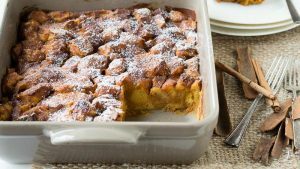 Maybe you have family visiting for the holidays and need breakfast ideas for a large group? 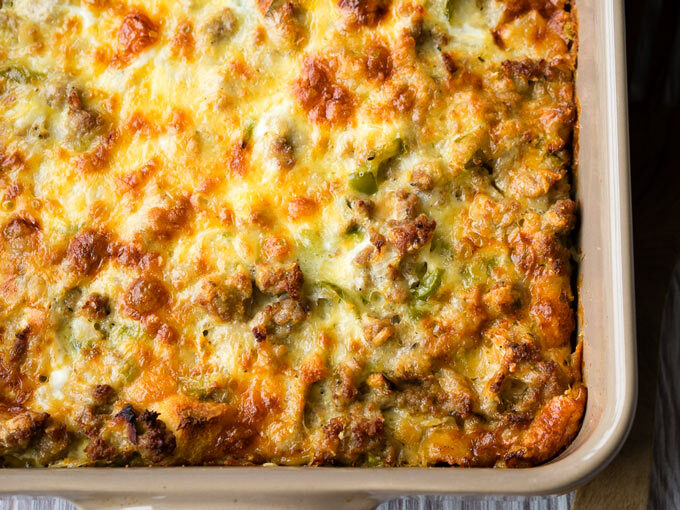 This Sausage Breakfast Casserole Recipe is a crowd pleaser. 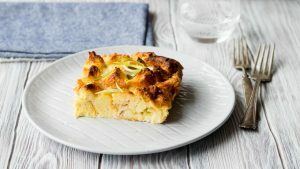 But if you can’t make this for whatever reason, here are other breakfast casserole recipes on The Worktop. I really hope I’m able to help you find a breakfast big enough to feed your group. Happy cooking! Trying it this wkd. Want to make it just in the morning so how long in oven then. Other similar recipes also say “ready in 9 hours” or something and i’m just confused. Does this mean it only lasts for 8-9 hours in the fridge before it goes bad? Hi Jess, I can see how this is confusing! So, you let the casserole sit in the fridge after you prepare it, but before you put it in the oven. That way, you can prepare it the night before so it’s ready to bake in the morning. It lets all the flavors come together, as well as allow the croutons to soak and soften. Once it’s baked, it can store in the refrigerator for a couple days. Hi Tina! 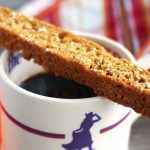 This breakfast recipe sounds like a dream come true! Thanks ever so much for posting it! Can you freeze any leftovers from it? Thanks. Hi Connie, I’ve never tried to freeze the leftovers so I’m not sure how it would turn out. Definitely worth a try though!